The civil rights icon talks about his work with UNITE HERE, and how unions like this lift us all up. For most Americans, Labor Day is a welcome three-day weekend, time for picnics and parties to mark the end of summer. Some are only vaguely aware that Labor Day was created to honor the American labor movement and the contributions that workers have made, through great struggle, to the prosperity and strength of our nation. Labor unions have been in decline in this country for decades, but attitudes about unions are changing and increasing numbers of Americans now view unions favorably. Some unions are growing, including UNITE HERE, which represents workers in hotel, gaming, food service, manufacturing, textile, distribution, laundry, transportation and airport industries. I’ve worked for UNITE HERE as a political organizer for over a decade now and I’m proud of the victories we win to benefit our members and their communities. As a gay man, I’m also proud of the contributions my union and others have made over the decades towards LGBT equality. I’ve lived long enough to witness truly extraordinary advances ― from the days when we were deemed criminals by the state to the realization of marriage equality nationwide. But the struggle is not yet won and now, with Trump in the White House and Republicans in control of Congress, we know that our hard-earned rights are under attack and could be reversed. Most of us were devastated by the results of the November 2016 election. and it would be difficult to overstate the peril we face today as a result of Trump’s Electoral College win and the chaotic months that have followed. But that same election also brought victories that should be remembered, celebrated, and studied. In Nevada last year, thousands of UNITE HERE members hit the streets, knocked on doors. and talked to tens of thousands of voters. Because of their efforts and their allies, Nevada went blue. Not only did Clinton carry the state, Democrats captured both houses of the state legislature. Nevada also elected the first Latina to the U.S. Senate ― a historic milestone. In Arizona, UNITE HERE helped lead a coalition that registered thousands of new Democratic voters and kicked right-wing extremist Sheriff Joe Arpaio out of office after 26 years. UNITE HERE works with LGBT communities across the U.S. and Canada. This year, our members marched in 35 Pride parades ― from Toronto to San Diego, Vancouver to New Orleans. A majority of our members are women, people of color and immigrants. LGBT people are active throughout our union as members, staff and officers. UNITE HERE members share victories, defeats ― and sometimes tragedies ― with the LGBT community. Three years ago one of our members lost his partner to a hate crime in Los Angeles; beaten to death by strangers on his way home. Several of our members were present during the attack at Pulse Nightclub in Orlando last year, and the daughter of one of our members was among those killed. Just weeks ago, a leader in our union, Tee Tee Dangerfield, was brutally murdered in Atlanta. A transgender woman, Tee Tee was a union shop steward at Hartsfield-Jackson Airport and a proud and dedicated organizer for UNITE HERE. Tee Tee Dangerfield loved her union because when we win contracts, the workers end up with bigger paychecks, safer working conditions, and access to affordable healthcare. Our campaigns even raise the standards for workers in non-union properties by forcing employers to compete for the best workers. Although marriage equality remains the law of the land ― at least for now ― there are still many states where LGBT workers can be fired solely on the basis of their sexual orientation or gender expression. 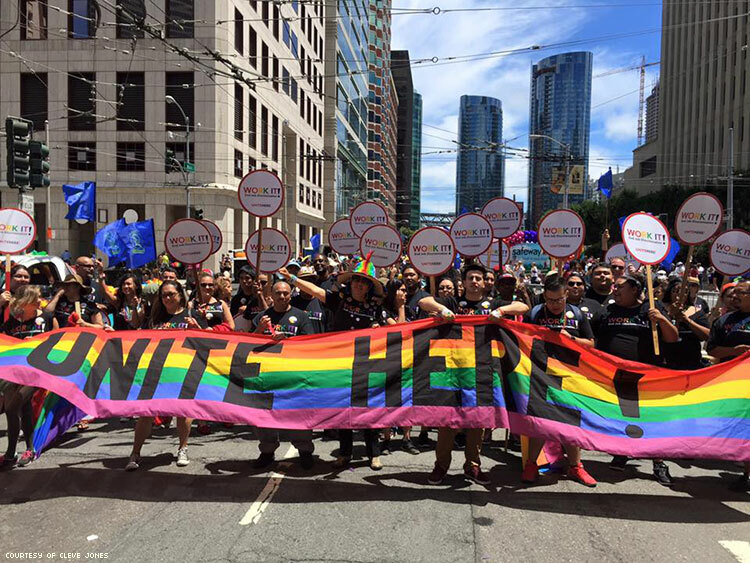 Through collective bargaining, UNITE HERE wins contracts that protect LGBT workers from discrimination in employment and harassment on the job ― even in conservative states like Texas, Georgia, and Louisiana. UNITE HERE was the first major union to call for full LGBT equality in all matters governed by civil law. We fought for healthcare for HIV/AIDS patients in the darkest days of the pandemic. We shine a light on the misogynistic, homophobic, and transphobic violence within the immigration detention camps. Whenever people march, speak out and organize to defend the rights of workers, women, people of color, immigrants and LGBT ― they march with our members. In the campaigns for universal access to health care ― you will find our union. UNITE HERE isn’t one of the largest unions in North America; we represent 270,000 workers. But we are one of the fasting growing unions in the U.S. We are also smart and strategic and win real victories for our members and our allies. Our members have earned the trust and support of LGBT communities across Canada and the U.S.
-Stay in hotels that treat their workers with respect. -Honor union boycotts and picket lines. Don’t eat, sleep, or meet in boycotted properties. -Join UNITE HERE’s www.fairhotel.org to find fair hotels and avoid labor disputes. -Let the management of hotels and other businesses you patronize know that you support workers’ rights to organize. -Rally with us in UNITE HERE’s “Serving our Country” Day of Action on October 19. Enjoy this Labor Day with your families and friends and please take some time to remember the working people of all colors, genders, orientations, faiths, and ethnicities who built this country and keep it running. And if you’re staying in a hotel, or grabbing a sandwich at the airport or celebrating at a casino, say hello to the workers and smile. CLEVE JONES is a longtime LGBT and labor organizer, creator of the AIDS Memorial Quilt, and author of When We Rise: My Life in the Movement.